Robert F. Kennedy, 74, of Des Moines, IA died May 15, 2018 at Taylor House Hospice in Des Moines, Iowa surrounded with love. He was born September 1, 1943, in Morgantown, WV, son of William F. Kennedy and Betty Jo Blosser. Robert was raised primarily by his grandparents, W.E. and Nellie Blosser and his aunt and uncle, Mary E. and John A. Bertie as his father was killed in the military 6 weeks before Robert was born. Robert graduated from Morgantown High School in 1961, and received his Bachelor of Science in Aeronautical Management from Embry-Riddle Aeronautical University, Daytona Beach, FL in 1977. 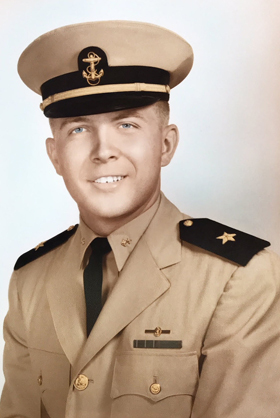 He was a decorated U.S. Navy veteran of the Vietnam War having served in various naval aviation squadrons and other units as a Naval Flight Officer. Among his awards were three Air Medals, the Vietnamese Air Cross of Gallantry, and the Meritorious Unit Citation. After leaving active duty, he served in the U.S. Naval Reserve retiring in 1988 with over twenty-one years of combined active and reserve duty, with the rank of Commander, USNR. Robert followed his lifelong love for airplanes and was employed as the Airport Manager in Akron, OH, La Crosse, WI, and Charlottesville, VA before moving to Des Moines where he was employed by the City of Des Moines as the Airport Properties Administrator from April 1986 until his retirement in August 2005. He is survived by his wife, Sarah Etta (Summers) Kennedy; son, Robert F. (Traci) Kennedy, II of Des Moines; daughter, Beth Ann (Daniel) Davila of Chagrin Falls, OH; six grandchildren: Kelsey (Justin) Nichols, Hunter Kennedy, Patrick Kennedy, Payton Kennedy, Madison Davila, and Raelayn Davila; and great-grandson, Evan-Lewis Nichols. Services will be held at Hamilton’s on Westown Parkway on Thursday, May 24, 2018 at 11:00 a.m. Family will greet an hour prior to the service. Burial will be at Beverly Hills Cemetery in Westover, WV with graveside military honors. Hastings Funeral Home in Morgantown, WV will handle burial arrangements. Memorials in Robert’s honor may be made to Taylor House Hospice, 3401 E Douglas Avenue in Des Moines, IA 50317.